It's funny how things turn up. A local professional guitarist had read a review of my Variax equipped guitars and was taken by the fact that it had only one pickup-albeit a dummy. He had always hankered after having a stripped down simple looking guitar. What he didn't know, until he discovered my web site, was that we lived about eight miles from each other. A phone call later I had taken on a few simple set ups for him and we chatted about the possibility of building a distressed guitar, similar to Jeff Beck's famous Fender Esquire that had originally belonged to John Maus, guitarist with the Walker Brothers (who did the Strat type body contours on it). I had recently built a couple of "Thinlines" and so quite a straight forward job, or so I thought. Steve had already bought a second hand Variax but it was the 600 model with tremolo. The electronics and controls on the 600 and the 300 models are mounted on boards inside a chassis that fits under the Variax's pickguard. The older 500 and 700 Variax models had the controls on flying leads, giving considerable freedom to there positioning. So it seemed a no go. 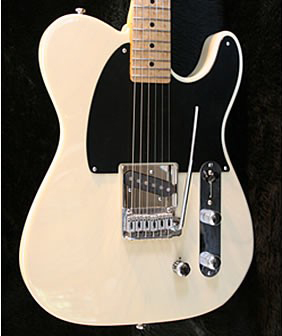 I tried to persuade Steve to opt for a Thinline pickguard which, with a little remodeling, could accommodate the gubbins from his 600. But no - Steve didn't want that. 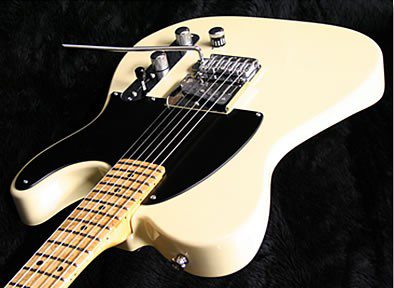 It had to look like an Esquire but with a trem. That I thought was an end to it but I couldn't let it go. I finally decided that by dismantling the electronics, discarding most of the chassis and replacing the 24 strand ribbon cable from the control board to the main board with longer more flexible hand wired loom it would be possible to mount the main circuit board from the front and the controls from the rear. Suffice it to say it took a great deal of sussing but in the end I had an arrangement that would work. The build was quite straight forwards after that. The body was bookmatched swamp ash finished in a transparent blond and the neck was flamed maple with a birdseye board. 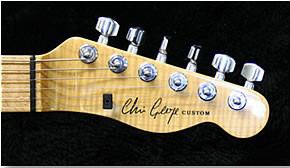 A thin satin nitro-cellulose finish was put on the neck with only the peg head finished in gloss. 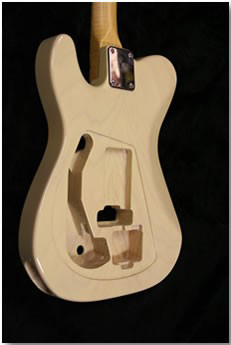 A Strat type body contour was carved from the back but no forearm carve on the front (As on J B's original). Steve and I had both decided to not go the way of distressing the guitar but rather let it get naturally worn in over time. As Steve gigs four to five times every week the guitar will soon be worn in. One of Steveâ€™s main gigs is with the Queen tribute band "Monarchy", so as another guitar leaves the workshop we say, "Another One Bites The Dust"! I think a while back I did warn folk that if you ordered custom build you would probably come back for another. Oops it happened again. I was asked to build a PRS-alike with Variax electronics and conventional pickups. Dave, the customer, was adamant that it had to be a PRS body shape but did concede that the headstock could be slightly different. The spec. in brief was: - double cut set neck solid body, carved maple top, two humbuckers (Bare Knuckle “Crawlers”) and Variax electronics with S type vibrato. Oh and it had to be blue and if possible to have an inlay of an owl on it (Dave is an avid Sheffield Wednesday supporter). 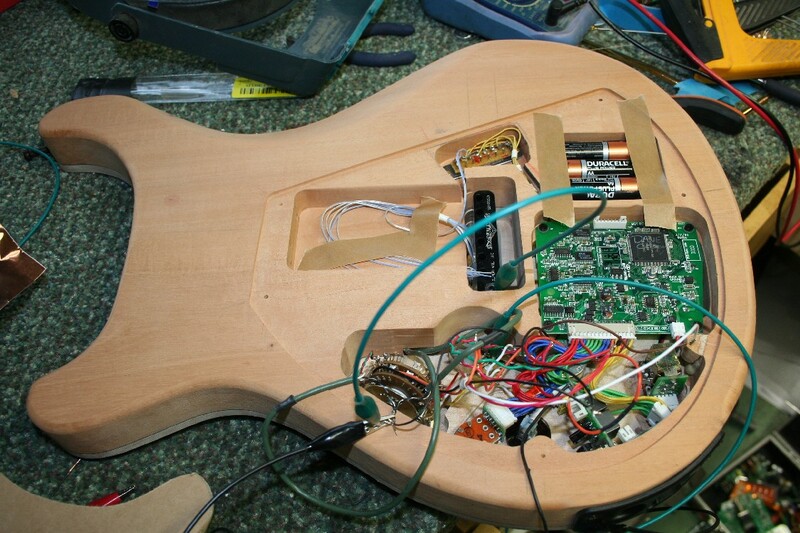 There were a few snags to be overcome, mainly Dave’s acquisition of a Line 6 Variax 600 guitar where the electronics are mounted inside a metal chassis making rearranging the components quite tricky, compounded by the electronics playing up!! By chance I had bought a second hand Variax 500 at a recent guitar show and we decided to do a swap. The 500, however, does not come with a vibrato and so we settled on a Super Vee Trem from Madison & Fifth, as I had used a couple these before and they were very traditional S type trems in terms of appearance. Now had I known then what I know now I would have used the system off the 600 Variax. I had to fit the Super Vee with Graph Tech piezo saddles and drill though the base plates and the spring steel plate that acts as the pivot on the Super Vee. After quite a few broken drill bits the job was done and the six individual saddles hard wired to the Variax main circuit board, doing away with the normal ribbon (Variax anoraks will know what I’m talking about!) sounds simple doesn’t it? - Not. 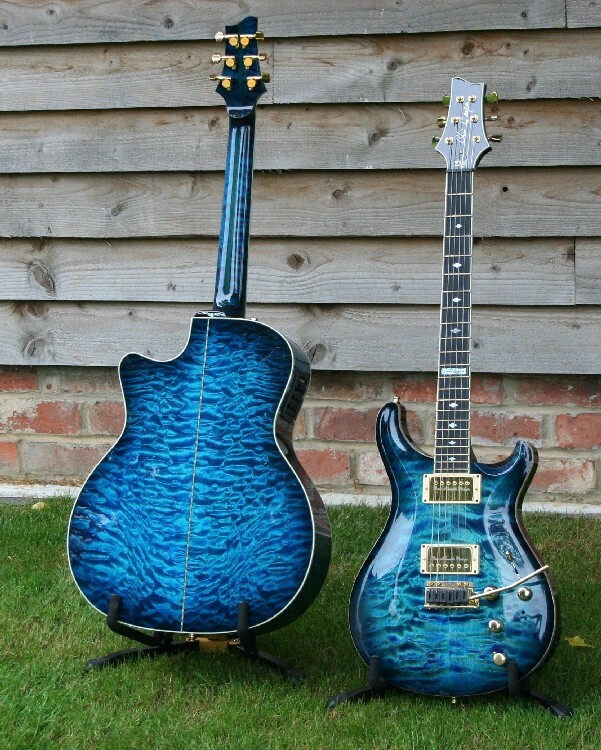 Anyway I had a real PRS in at the time and I copied the body and carved top including the sculptured lower cutaway horn, it’s really classy bit of design and does make huge difference to upper fret acces, nice one Paul. and a discreet push/push button to switch between Variax and Magnetic pickup modes and a 5 way pickup selector. (positions 2 and 4 in ‘mags’ giving coil taps on the humbuckers). This was a lot to get into a small space hence the dropping of the Variax tone control. Imagine Dave’s disappointment when he came to collect the guitar and found it had developed a horrible vibration that was quite audible acoustically. I did my best to track down the problem whilst he had a cup of tea, and discovered that the trem was everso slightly touching the body and a piece of tracing paper between the two temporarily cured the buzz but it meant that I would have to dismantle the trem and mod it slightly. So Dave duly drove back to Sheffield without the guitar but with no bad grace, which was impressive. I sorted the problem and took the guitar to him the following weekend so a happy ending!. Then about three months later Dave was back for a matching acoustic. Told you so! This guitar was to be a cutaway large bodied acoustic. The shape based on his existing one and to be fitted with an “all singing and dancing” pickup system. As with most custom builds it was a case of reinventing the wheel in the form new jigs and moulds. I decided to use a hybrid strutting pattern that was a combination of X bracing and classical bracing. 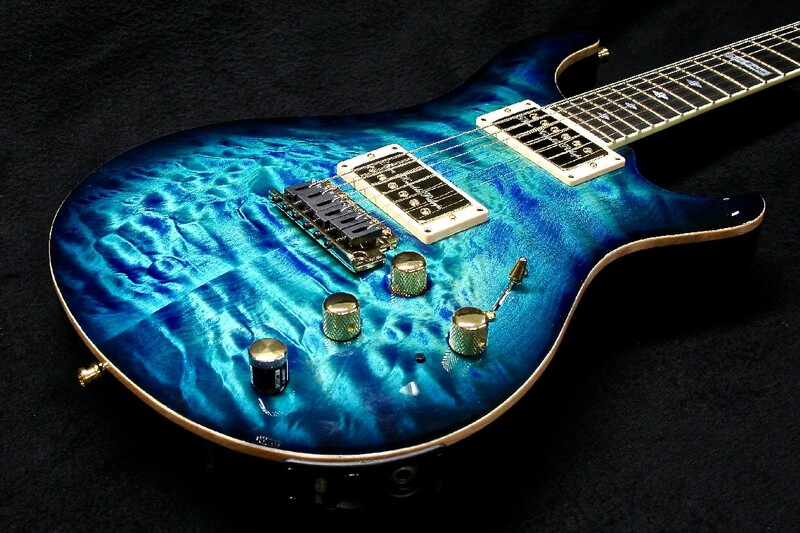 Again it was to be finished in Blue nitro cellulose We chose very figured quilted maple for the back and sides and quilted maple for the neck, the same headstock shape and again macassar ebony for the fingerboard and bridge to match the electric. 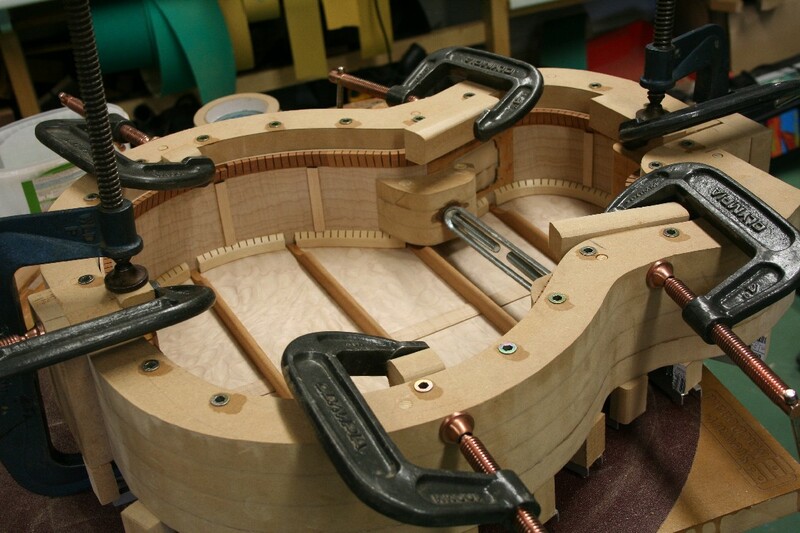 As this was to be a ‘stage guitar’ as well as an “at home noodler,” we included a bridge truss system to control the bottom end and to ensure no top distortion. 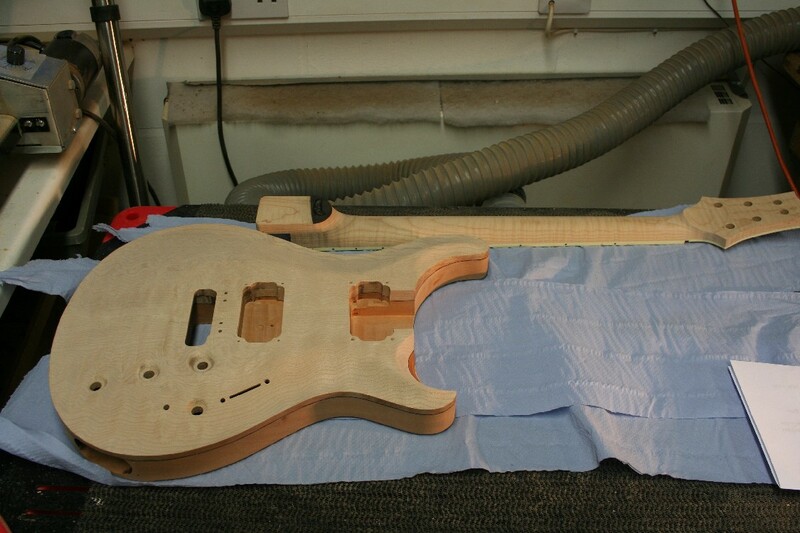 The build went smoothly according to plan and a Fishman Presys Blend pick up system fitted. The end result was a rather startling looking acoustic with a great sound, plugged and unplugged. 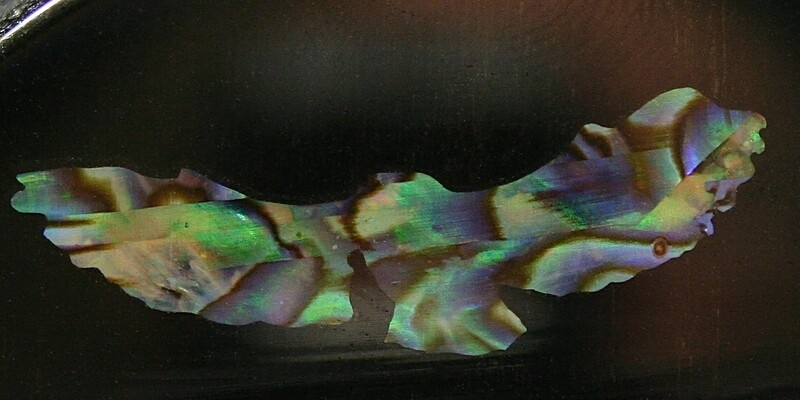 Yes of course it had another owl inlay on the heelcap. 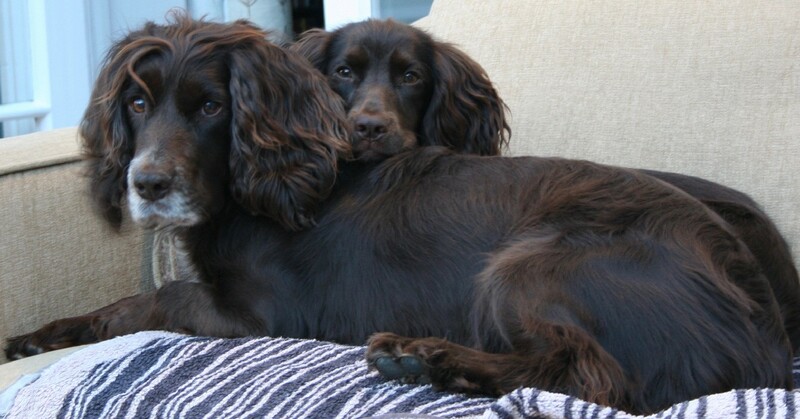 Oh nearly forgot the electric is called “Ellie” and the acoustic “Lola” after my two working cocker spaniels that Dave and his wife fell in love with!